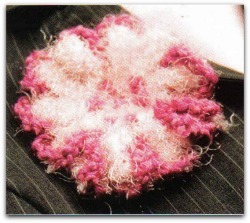 These 3 crochet flower patterns couldn't be easier to make. Using novelty yarn adds a very interesting touch. With light pink, ch 5; join to form a ring. Rnd 1:12 sc in ring; join in first sc. Rnd 2: Ch 5, sl st in 3rd ch from hook—picot made, ch 2, sl st in same sc—petal made; in each rem sc work (sl st, ch 5, sl st in 3rd ch from hook—picot made; ch 2, sl st)—petal made; join in joining sl st of previous round. (12 petals) Fasten Off. Rnd 3: Join raspberry between any 2 petals; *ch 5, sl st in top of next picot, ch 5, sl st between same petal and next petal; rep from * 10 times more; ch 5, sl st in top of next picot, ch 5; join in joining sl st. Fasten off. 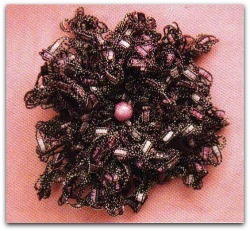 Step 2: With sewing needle and thread, sew round bead to center of flower..
With orange, ch 5; join to form a ring. 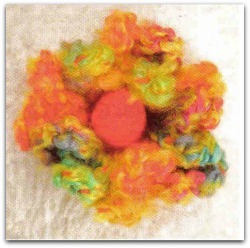 Rnd 2: Ch 5, sl st in same sc as joining; in each rem sc work (sl st, ch 5, sl st); join in joining sl st.
Finishing: Sew pompom to center of flower. Rnd 1: 12 sc in 2nd ch from hook; join in front Ip of first sc. each rem sc work (sl st, ch 14, sl st); join in unused back. Rnd 3: Ch 14, sl st in same lp as joining; in unused back lp of each rem sc of previous rnd work (sl st, ch 14, sl st); join in joining sl st.
Finishing: With sewing needle and matching thread, sew bead to center of flower.